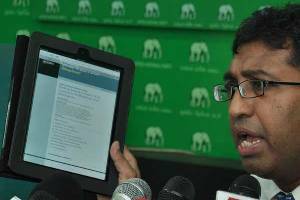 MP and consultant economist Dr. Harsha De Silva yesterday alleged that THE UNP’s criticism over the mismanagement of the economy and the Central Bank as well as the EPF’s investments in banking stocks have been emphatically validated by global rating agency Standard and Poor’s. “Standard and Poor’s reiterated what we have been saying for the last three years with the announcement it issued on Tuesday,” asserted Dr. De Silva, showing off S&P’s report via his tab at a press conference. As reported yesterday in the Daily FT, Standard & Poor’s Ratings Services said it has assigned Sri Lanka to its Banking Industry Country Risk Assessment (BICRA) group ‘8’. At the same time, it assigned an economic risk score of ‘8’ and an industry risk score of ‘7’. “First off I want to say that S&P and I have no involvement, but S&P is now saying what we have been saying for so many years. For stating facts, we were called traitors; they issued releases every two days and were slinging mud at us,” he emphasised. Noting that although some politicians and high officials in Government may not be experiencing the effects of the economic crisis, he said that the people were severely affected by it. According to de Silva, it was in this background, given the Government’s politicisation of the Central Bank and the resulting monetary policy, that he repeatedly stated some of the investments being made in the stock market must not be made. Referring to the S&P statement that it views banking regulation in Sri Lanka as being somewhat weaker than international standards, he also touched on its comments on governance and transparency of banks being comparatively weak, with the Central Bank and EPF transactions in the stock exchange being cited as examples. He said that when he revealed the NSB scandal, he was ignored, but finally the people had to agitate and the President had to halt the deal and send NSB Directors home. Asserting that the Opposition would continue to challenge the Government in order to battle corruption, he said that economic stability was not being destroyed by the Opposition but by the Government’s wrong and unsuitable policies. Pointing out that the UNP was not so bankrupt as to tell the EPF not to invest in the stock market, he said he was not making such an irresponsible statement, but that when S&P says there are problems in regulation, transparency, governance and the institutional framework, it means confidence in Sri Lanka as a whole is falling. “When you say investors are not coming, don’t shoot the messenger; you have to solve the problem. Attacking me will not bring in investors. Commenting on the use of the BICRA methodology, Dr. de Silva said that it was the first time it has been done and that BICRA was a very good methodology, widely accepted by all stakeholders. He noted that BICRA looks at two things: conomic risk and industry risk. Economic risk is broken down into economic resilience, economic imbalances and credit risk in the economy. Then in the industry risk category, they look at institutional framework, competitive dynamics and system-wide funding. “In Sri Lanka’s case, particularly institutional framework where banking regulation and supervision, regulatory track record and governance and transparency is concerned, we have scored very poorly. Dr. De Silva said he has been continually pointing out the governance issues in the banking system to the IMF and everyone else over the last two-and-a-half years. “I am disappointed that this time the IMF didn’t mention any of the governance issues in the financial system.